The question we all have is how do they do it? How do they balance working from home and homeschooling? We dig deep in these interviews and ask tough questions so that we can learn and try to implement some of their advice and ideas into our own lives. 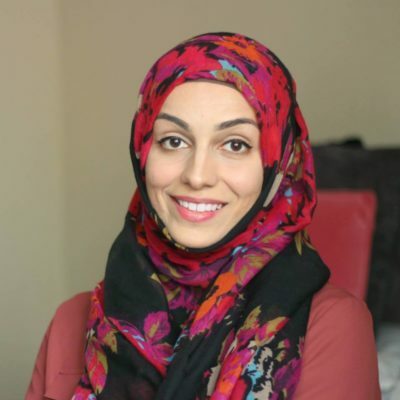 With that said we continue our interview series with Dr Gemma, she is the person behind one of my favorite homeschool blogs, Our Muslim Homeschool. Her blog has been nominated for 2 Muslimah Bloggers awards Best Parenting/Education Blog and Best YouTube Blogger. You can vote for Gemma by clicking this link here . Voting closes Saturday and after the interview I am sure you will understand why she is deserving of the nomination and inshaa allah the award. So without further ado let’s jump right into the interview. 1. Please introduce yourself to those who may not know the person, homeschooler, and entrepreneur behind Our Muslim Homeschool. Assalaamu Alaykum! Thank you so much for the honor of being featured on The Muslimah Guide. I am constantly humbled by the support I have found among the online Muslimah entrepreneurial community. As you mentioned, my name is Dr. Gemma Elizabeth, and I am a homeschooling mother of 3 rambunctious kids. We live in the North of England, and despite the rain and wind, we find warmth and comfort in our little homeschool life. Homeschooling wasn’t always the plan for me. After many years training and working as a veterinary surgeon, I decided to give it all up to home educate my children. As a vet, the demands on my time were too great, and I didn’t want that life for myself, or for my children. In addition to my responsibility to educate the children, and run our home, I am also the chief editor for the homeschooling website Our Muslim Homeschool. 2. So I have recently watched your YouTube video on a day in your homeschool life, but how does your ideal workday look like? Where do you find the time to blog and manage your online store? My ideal work day is not a full day! As my business has grown, I have had to allocate times in the week that I will use for work. During these times, my priority is creating new content, YouTube videos, editing photos, or liaising with other members of the team. At the moment that is only three half days in the week. I wish there was more time! However, I try to use this time as efficiently as possible. Everything else, like posting on social media, answering emails and comments, has to be done in those random pockets of quiet that happen during the day. Unfortunately, these moments of calm can’t be planned, but I just try to make the most of them when they arise. If I have a deadline to meet, I will stay up until the early hours of the morning working after the kids are asleep. However, I try to do this very rarely, because it impacts on me the next day and the children deserve me at my best. My online store is a new venture. As you can imagine, I do not have the time to create the products myself, as all the marketing that goes with it; so this task has been outsourced. Something that I’ve learned over the last few years is that multi-tasking doesn’t work for me. Instead of being efficient and getting more done, it actually creates more chaos and less focus. So now, when I am working I am working! I am not waiting for the laundry to finish so I can hang it outside, or cook the kid’s lunch, or constantly checking my facebook page. I focus on my work. Similarly, when I am with my kids they have my attention. I am not checking emails on my phone or answering messages on Instagram. This intentional and purposeful approach has brought more peace and balance into our home life. 3. How do you motivate yourself to get all that work done daily? My biggest source of motivation has been the incredible community that we have built over the years at Our Muslim Homeschool. The support I receive from other mothers and homeschoolers is what keeps me going. On a daily basis, I receive many emails and questions on social media. These questions assure me that my work is needed and that the needs of Muslim Homeschoolers are not being met elsewhere. It motivates me to keep going and pushes me to provide them with what they need, and to find ways to serve them. Ultimately, that is what I see Our Muslim Homeschool as; it is a service for the Muslim Homeschooling Community worldwide. 4. What would you tell other mothers, homeschoolers, mompreneurs who have a dream that they want to chase but doesn’t know if they has the time, money, or support to see it through. Firstly, don’t dismiss your dreams! Dreams are what define you. Allah created us all unique, and your talents and ambitions are part of who you are. Embrace them! When thinking about how to approach your dreams of entrepreneurship, choose something you love! Don’t choose something just because you think it will make money, or it is a popular niche. Choose something that you are passionate about. It should be something that lights a fire in your belly and makes you want to jump out of bed even when you’re sick! The next step is to do your research; get to know your niche inside-out! What can you add? What service can you provide? Then once you have created a clear plan for what you want to achieve, ask advice from people you trust and respect. I would always advise you to dream big but start small! When setting up your business or blog, choose the free options initially until you really know what you’re doing. Don’t invest too much money at the beginning, and definitely do not get into debt. 5. Do you have favorite tools and/or resources that make your days easier and/or more organized? For my homeschool life, I couldn’t find a homeschool planner that really met all my needs. So I created my own! and is available to buy from my online store insha’Allah! For my business, I love the Epic Blog Planner. It is both a business plan and editorial planner. I love it and would definitely recommend it to any other blogger who wants to progress their blog from being a hobby into a serious business. As a work-at-home mum, organization is very important and time is precious….but I’m sure you knew that already! If you have any questions, please feel free to leave them for me in the comments section below, or find me online. Thank you once again inviting me for this interview. It’s been fun!